Shopify has a few apps that can automate the tedious work of your dropshipping business. 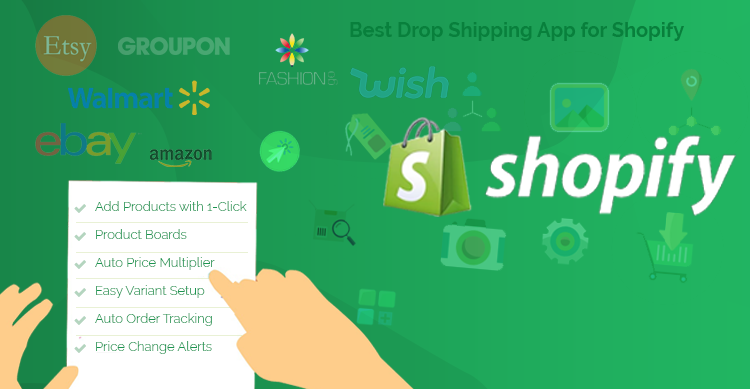 If you are into dropshipping, here we are have noted down the must-have features for best Shopify Dropshipping app to use on your site. If you haven’t started your eCommerce store on Shopify yet, you can start with a 14 Days free Shopify trial account from here. Best Shopify Dropshipping App Must-Have Features – Even For Starters! When using any application, if you need to go through the user manual for each step, it gets tedious to work with. Along with that, even if the instructions are not clear then actually doing what you needed to do is not possible. So usability and easy to use is a must have. When you are dropshipping; delay of minutes if not seconds can cause you to lose customers. And using an application with complicated user interface and compact features that are way too difficult to understand is a drawback. What makes dropshipping so popular? The simple nature of how the business is operated. You list products on your Shopify platform and send the orders to the supplier. If you are having trouble adding products to your Shopify store itself, you are bound to fail at dropshipping. So make sure that adding products and even product variants is not just easy but also a flawless process. Along with that, you don’t want to take unnecessary step to first select your product and then import that product to your store. What you actually want is to import the products in bulk to save time while staying confident about which products you are selling through your store. In Shopify, we call these collections. Directly importing your products to your Store will add to your Homepage collection if you just started your Shopify store. What if you could define which products should go into which collection? This improves the usability of your Shopify based drop shipping web shop. And it also improves the management of your Shopify store. It is obvious that at times you will need to reduce your margin to sell more and at times you want to get higher margins for the product you drop ship. Inability to make changes to product pricing is like operating in a controlled environment. Along with that, you may want to improve the product listing and improve conversion by changing images too. And your dropshipping app should facilitate for that need as well. When you are dropshipping, one of the main problems that you can face is stock going out of order. Instead of manually searching the products to drop ship, you can set multiple suppliers for the same product. If your dropshipping app has this feature, you will be able to prevent the bad reviews from customers and will be able to maintain your goodwill to gradually expand your business. We are all aware that AliExpress is one of the most preferred merchant to import products from when it comes to drop shipping. But occasionally, we may want to import products that are not shipped from China. So using an app to import products from marketplaces like Amazon, eBay and couple of others increases your goodwill and helps you stand out in the competition as well. When you import the products from vendors and list them on your site, the product details are mostly same every time if you didn’t make any changes. But what if the vendor changes those product information after you have imported? This can create a major dispute among you and your customers and even more if the information is as sensitive as product pricing. For this reason, it is absolute necessary for your Shopify Dropshipping app to alert you when vendors make changes in their product pricing so you can follow that accordingly. Which app do we recommend you to automate your Shopify Dropshipping business? As of the time of writing this blog, two key players in drop shipping are Oberlo and Dropified. You can check the feature comparison between Oberlo and Dropified here. Though Oberlo has been quite popular in the drop shipping arena for Shopify Users, here are some of the features that Dropified offers which Oberlo has missed to implement at the time of writing this blog. If you are running different Shopify stores for different niche markets, Dropified really serves your purpose. Before publishing the vendor’s products on your site, you can check, research and organize those products on the Dropified Boards. You may have the idea to better represent the products and Dropified allows you to do so on your Shopify store. This app has almost 10,000 US products in the database which will make your product management easier. You can simply add products to your Shopify store with just 1 click. Oberlo requires to select products and then import products. Having to individually change the same thing on each and every product manually is not just tiresome but is prone to errors too. So Dropified allows bulk editing of products. When you change product information, you might need to refer to the original description, titles or other such values. For this you can save original product information for future reference. You have the option to save shipping options for customers who are frequent buyers of your site. This helps you to check and tally the previous shipping details and avoid possible shipment errors. You can keep notes about products, when you updated the product information or by how much your pricing impacted the sales and such when you are using Dropified. If you find an image that would better represent the product than the one that the vendor is using, you can change that product image. Since you are selling from your own Shopify store, you can add description or offers to the secondary product images to improve conversion of your products. As much as making sure that the product is delivered to the customer is necessary, tracking those shipments are equally time consuming if there are many orders. Dropified offers auto scan of tracking numbers for this purpose. To avoid the confusion about new orders and fulfilled orders, using Dropified app helps by automatically marking the orders as fulfilled. Manually adding color, size and other type of variation on your Shopify platform is a tedious job. This is simplified by Dropified through the Advanced Variant Mapping feature. Selling the products available from one supplier only may create problem. Dropified offers to add multiple suppliers per product and switch between the suppliers to fulfil them. Listing products without shipping information creates confusion for customers who are ready to buy and may reduce conversion. So Dropified offers to create free or shipping version of the products. The products that you want to sell or your visitors are searching for may not be available in the same merchant. With Dropified, you have the option to import products from over 30 merchants. AliExpress is the most popular merchant among dropshippers. So, Dropified has provided the option to filter products from Top Rated sellers only. Dropified allows you to fulfil orders in three ways – step by step checking for fulfilment, 1-click fulfilment and 1-click fulfilment with shipping option. While importing products from AliExpress, manually solving captcha is a tedious job if you are importing bulk products. This feature of Dropified helps you to get rid of this cumbersome task. We know that product reviews are an integral part contributing to the conversion. With the ability to import products along with their reviews, you have the benefit of attracting more conversions. Still wondering whether the features of the best Shopify dropshipping app features mentioned in this post will help you grow your dropshipping business? You’ll have to use it to find out!